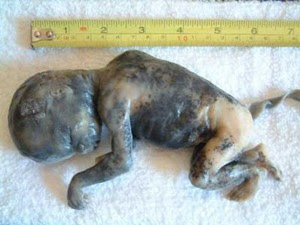 One reason abortion prevails in America has been the media black out of the images of the suffering babies being killed. Unlike the images of suffering animals which undoubtedly raise big $$$$ for the Humane Society, pre-born infants images are kept in the main stream media lock box. For years front line rescuer, Jo Scott, stood alone in her determination to show abortion minded moms the reality of what they were about to do. The pro-life industry squawked that the images tainted the "professional image" of their leaders in their ivory towers. Perseverance paid off and now a msm outlet has used this image of how a saline abortion scalded this tiny one, ending his or her life. Thank you, Examiner for showing a glimpse of abortion's cruelty! Personhood would define a baby as person from the moment of conception. "The Colorado Personhood amendment will be on the ballot in 2010," says Jo Scott (avid Personhood supporter). "That is no thanks to the Colorado Secretary of State’s office. In order to get the Personhood amendment on the ballot in Colorado , 76,000 signatures were needed by late January. 79,648 signatures were turned in on time." On March 4, the Secretary of State disclosed that 20.63% of the 79,648 signatures submitted by Personhood Colorado were invalid. The signatures were thrown out because of a recently implemented law prohibiting Colorado notaries from stating “personally known” on a petition as a valid ID. The new law was literally unknown to the notaries in the state. Even the Secretary of State, Bernie Buescher, was unaware of the law. Although a spokesman for the state says the law is clear, it is not the citizen’s duty to train notaries how to do their jobs. A lawsuit is currently being considered by Personhood Colorado to vindicate the thousands of signatures that were tossed.